The AwesomeCloud team is happy to announce that our channel partners now have the ability to manage their virtual machines through Microsoft’s App Controller for System Center 2012. 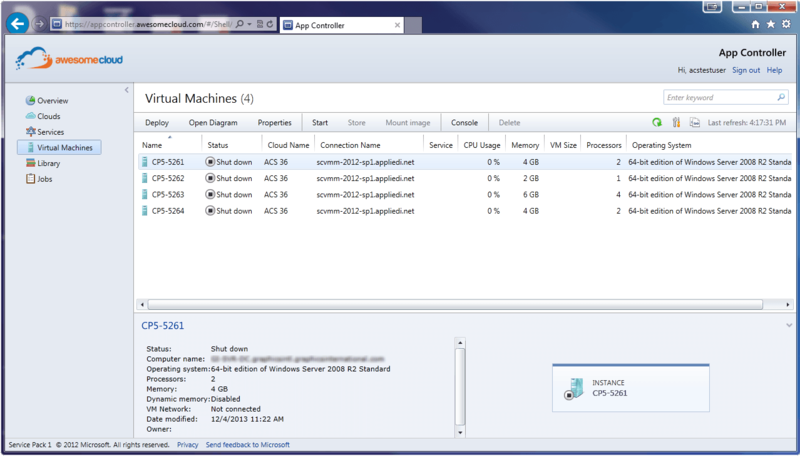 By leveraging App Controller, you will be able to start, stop and restart each of your virtual machines over the web. This will also provide you with up-to-date information, such as the number of machines you are currently running, the names of those machines, and the physical resources that each machine contains. The App Controller rollout is the first step in part of a broader effort to provide our partners with a self-service portal that enables partners to more efficiently manage their cloud computing resources through a unified online portal. The portal will enable partners to create quotes, manage billing, provision new solutions and manage existing virtual machines. App Controller is a stop-gap designed to provide virtual machine management while the same VM management functionality is built into the online portal. The online portal is progressing nicely and we’re in the process of doing a final once-over on the first release. The first phase of the online portal includes the ability to quickly generate pricing quotes and save pre-defined quote templates for future use. Future online portal releases will add the ability to manage billing, provision solutions, and manage your existing machines for each of your clients. The goal of our online portal is to provide each of our channel partners with a way to manage all of their AwesomeCloud resources from a single interface. We’re also rolling out web-based firewall access for partners during December. More on that next week. If you would like to use App Controller for System Center 2012 to begin managing your AwesomeCloud virtual machines, please contact your account manager, John Donnelly, by emailing jdonnelly@awesomecloud.com, by completing a support request, or by contacting us over Twitter using the @awecloud handle. 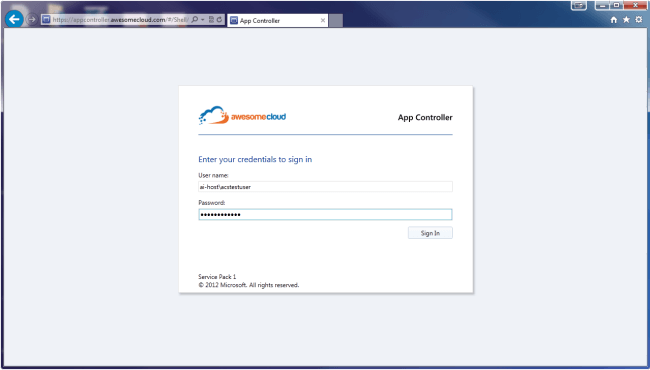 After you’re in touch, we’ll prepare the necessary credentials so you can manage your virtual machines using App Controller. 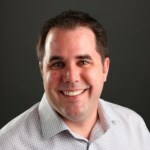 As Chief Systems Architect, Wayne Lansdowne is responsible for the entire Awesome Cloud Services infrastructure and performance. With over 10 years of experience at the company, Wayne has filled many roles and truly knows the in-and-outs of the business. He started out focused on customer support and progressed into more specialized roles throughout the years.